If you are in need of a dance floor for your wedding reception, party or event, then look no further than KG Entertainments. We are experienced in all areas of providing entertainment services, and can supply LED dance floors in Surrey, London, or elsewhere in the South East. You find the venue, and we will supply the dance floor. By hiring your LED dance floor from us, it leaves the choice of venue you hire more open as you will be able to consider many more places that might not appear suitable for dancing. 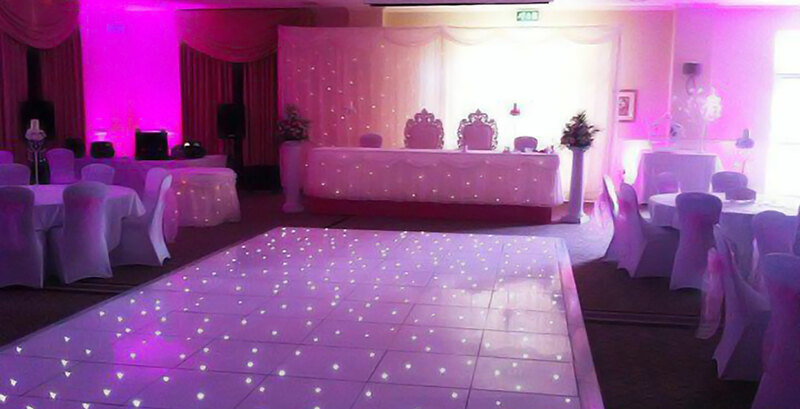 Even if the venue you have chosen does have a dance floor, it is still a good choice to hire in an LED dance floor from us at KG Entertainments, which will provide not only a designated dance space, but also a bit of party glitz and glam which will have the guests dancing the night away. The dance floors we supply come in either all black, all white or a mixture of both if that is what you prefer. Sizes start at 10ft x 10ft, and then you can request larger sizes from there. Don’t worry if your event is a large one, we have the capacity to provide extra large dance floors for hire. KG Entertainments are professionals in all areas of entertainment supply, such as DJs for hire and novelty photo booths, as well as being first class suppliers of LED dance floors. If you are looking to hire dance floors in the Surrey area, or further afield, simply just get in touch with us and we can provide you with availability and a free no-obligation quote, as well as advise you on anything else you might need to know.